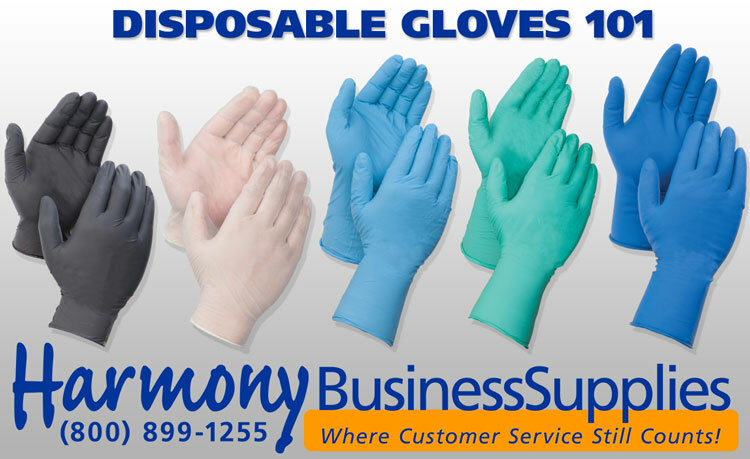 Disposable gloves keep your hands and environment safe from contaminants, chemicals, and other dangers. Disposable gloves are used for hand protection in medical, forensic, scientific, automotive, food service, cleaning, and industrial applications. Single-use gloves come in a variety of materials and are used in industries worldwide. Disposable gloves are used in medical examinations and procedures to create a safety barrier that helps to prevent cross-contamination. This keeps medical personnel /caregivers and patients safe. Un-powdered gloves (which are covered below) are used more often during surgery to prevent contaminates. Medical and examination gloves are usually of higher quality materials and thickness to prevent tearing and punctures during procedures. If you’re handling or preparing food, disposable food gloves are a necessity. Food gloves ensure your food and employees stay clean and sanitary and provide a barrier against germs. Single-use food gloves are conveniently disposable so you can just throw them away after use. Latex-alternative disposable gloves (such as nitrile or vinyl) or often used in food handling due to possible latex allergies. The most popular food handling glove is made from Polyethylene. These low cost gloves are perfect when you need to change gloves often and need light protection. General Purpose Disposable Gloves are just that. Used in many industries and shops to keep hands clean and protect against chemicals and more. General purpose disposable gloves are available in latex, nitrile, chloroprene, and vinyl. Each material has unique features (covered below). Use general purpose disposable gloves for light duty cleaning, painting, maintenance work and more. Durable latex gloves are great for a variety of uses across medical and industrial applications. Latex gloves come in a variety of sizes, with powdered and powder-free options. Powder helps with easy donning of the gloves. Latex gloves are more elastic than nitrile and more puncture resistance than vinyl. Latex gloves naturally offer excellent chemical resistance. Using latex gloves is not recommended if you have a latex allergy. Nitrile is a synthetic version of latex. Nitrile disposable gloves have higher puncture and chemical resistance than other materials. Nitrile offers great protection against punctures, cuts, and snags. Nitrile gloves are often used in medical applications and procedures for these reasons. Vinyl disposable gloves are a good alternative for those allergic to latex gloves or dislike other types of gloves. Great for single-use applications. 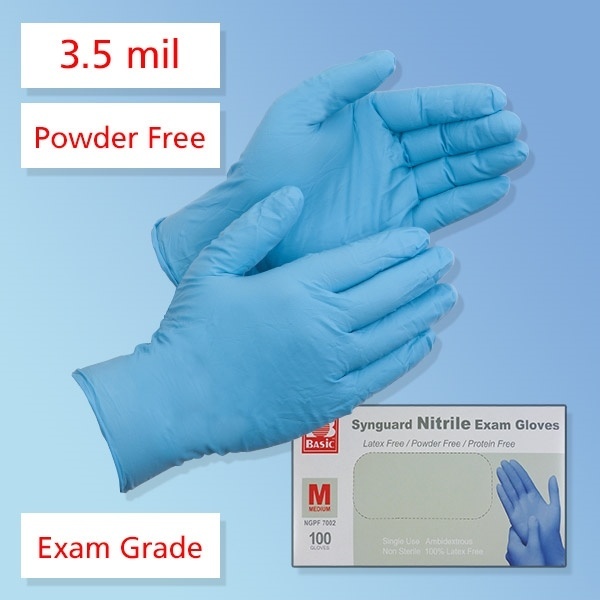 Exam Grade Vinyl Gloves are ideal for protection in a wide range of medical applications. 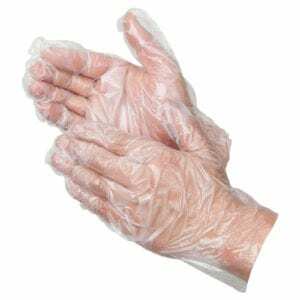 Food Service Vinyl Gloves are often used in catering, food handling, and food prep. Vinyl gloves are available with or without powder for easier donning. The lowest cost and least protective type of disposable gloves are polyethylene gloves. These are ideal however for food handling, catering, and other food industry related applications. 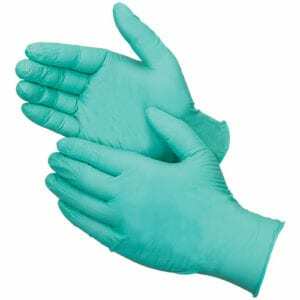 Polyethylene single use gloves keep your hands clean and offer basic contamination protection. Do You Need Sterile Disposable Gloves? Medical and Exam Disposable Gloves are available in sterile options. 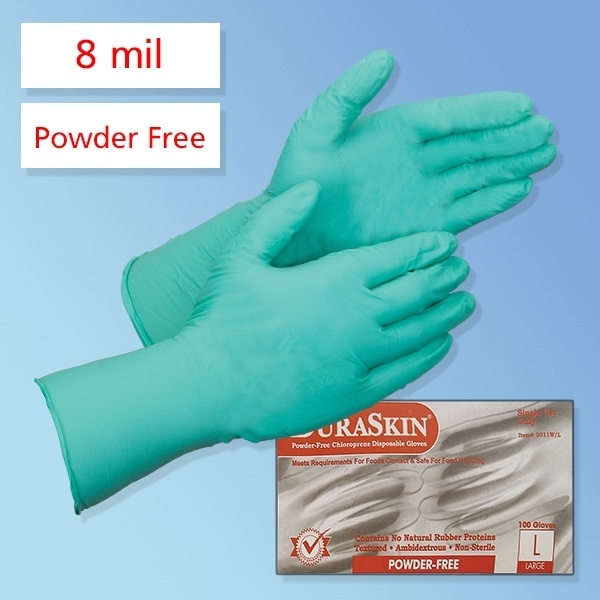 Sterile gloves are also used in cleanrooms and controlled environments. If you are doing work where any possible type of contamination is a worry, opt for sterile gloves. Sterile gloves are sterilized and come in sealed packaging to maintain freshness and sterility. Disposable gloves are made of different polymers including latex, nitrile, and vinyl. They come un-powdered, or powdered to lubricate the gloves, making them easier to put on the hands. Again, if contaminates are a concern, opt for powder-free disposable gloves. However, for other applications, powder makes the gloves much easier to wear and change out. If you have any questions or can’t quite decide what type of glove you, please give us a call and we’ll be glad to assist you in your selection! Employers are required by law to provide their employees with acceptable personal protective equipment (PPE). This is to ensure the employees’ safety and minimize potential risk. PPEs should be utilized in conjunction with a controlled work environment to complement each other and act as the final barrier between a hazardous chemical and an employee. Gloves are a major part of personal protective equipment, but the sheer number of options can be daunting. Below, we will break down the specifications of each glove type. Many consider Latex Gloves to the be industry standard. It provides the highest level of touch sensitivity and dexterity allowing an extreme level of precision. Latex provides an optimal barrier against infectious material and biological contaminants. An ideal choice for those seeking latex-like attributes, but are allergic to latex itself. Vinyl gloves are designed with a loose fit making it more comfortable than latex. While still being extremely comfortable for long term use, vinyl gloves are designed more for short-term activities. A latex-free glove that provides superior strength and protection. It’s level of dexterity and touch sensitivity is slightly below latex. Nitrile gloves are excellent for highly demanding jobs due to its resistance to puncturing. A low-cost, temporary barrier between hands and a material. Often used in the food service industry due to its cost-effectiveness. They are easily put on and taken off thus are perfect for temporary and short-term uses. Offering the fit and feel of latex, they are still a 100% synthetic formulation (latex-free). They are more puncture resistant than latex while providing superior protection against corrosive chemicals. It offers an incredible grip in both wet and dry environments. The type of glove used depends on what level of protection is needed. Generally, thicker gloves provide greater chemical resistance even though thin gloves can be made to be as strong as their bulkier counterparts. Gloves can be purchased in either powder or powder-free options. The power is usually USP cornstarch and acts as a lubricant in the donning process. This powder, through its reaction with latex, can cause latex allergies. This is where powder-free latex gloves and latex-free gloves come into use. 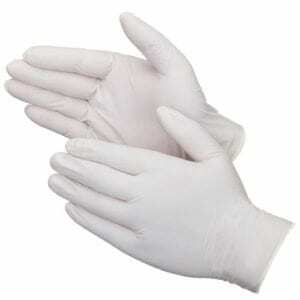 Medical gloves, otherwise known as examination grade gloves, are designed around the quality requirement of the FDA. Originally intended for hospital settings, they have seen use in other fields where a higher degree of protection is required. The food service industry uses gloves designed for short-term use, such as the polyethylene material. Gloves are an essential piece in minimizing cross-contamination. Industrial gloves are not regulated by any US government agency, however, the American Society for Testing and Materials does set standards which our gloves conform to. Gloves in general typically last 3 years from the date of manufacture, if stored properly. Disposable gloves should be stored in their original packaging, away from extreme temperatures, and excessive dust, sunlight, and moisture. Browse our Disposable Gloves section here.